Knee Valgus often know as knock knees and flat feet are common and often interlinked and will often result in knee pain. The above can occur at the bottom of a squat/lunge, or simply walking. Can be due to structural deformities like rheumatoid arthritis or a deformity of the knee joint, femur, or tibia which can’t be prevented. 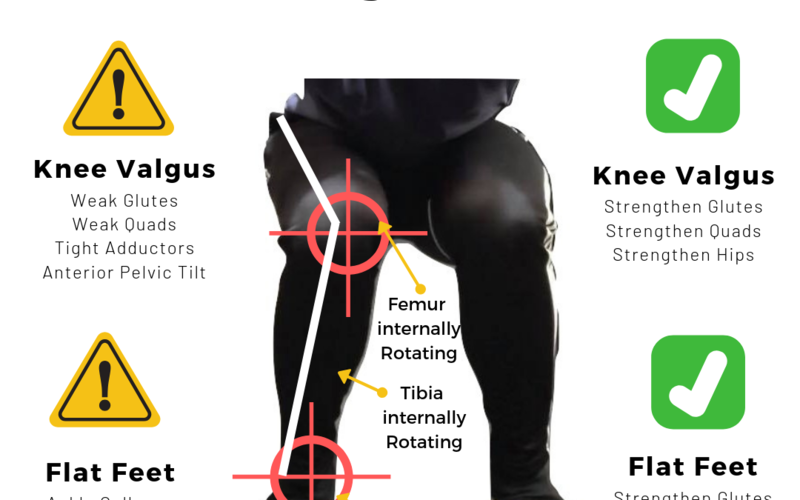 However knee valgus causes by muscle imbalance and poor posture can be prevented. A good place to start is with your feet. Always work from the ground up. If the foundations are not working properly, everything else on top will suffer.